One of the activities at AAS 221, Long Beach this year was a tour of SOFIA, the Stratospheric Observatory For Infrared Astronomy, which is more colloquially known as the Boeing 747SP with a telescope in its belly. Last Sunday, your intrepid author ventured onto this US/Germany-supported aircraft to observe the telescope in person. The following documents her journey through the NASA Dryden Aircraft Operations Facility, and especially her journey to SOFIA’s innards. Why do we need SOFIA? Most telescopes spend their lives in one of two places: the ground, or in space. A few balloon-borne detectors kiss the vacuum of space from the highest regions of the atmosphere. 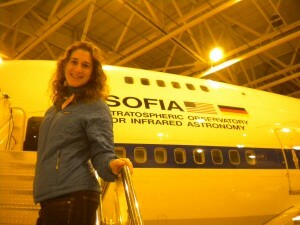 However, SOFIA is the largest airplane-borne telescope. Like balloon-borne detectors and satellites, SOFIA collects its data high above the majority of the atmosphere. Getting above the atmosphere is critical at infrared wavelengths because water vapor in the atmosphere is a very efficient infrared absorber (see the water absorption spectrum here), which means that very little infrared light makes it from space to the ground. So if you want to observe in the infrared (which you do if you want to observe, say, the births of stars in stellar nurseries, or the glowing dust in distant galaxies), you need to get above the atmosphere. To maintain an altitude of 40,000 feet for 10 hours, SOFIA burns a lot of fuel (the exact amount depends on the observing strategy). The expenses of flying a telescope around in a 747 are enormous (NASA already pays about 80-90 million dollars per year so far to keep SOFIA running, which is as much as it pays for the Hubble Space Telescope). However, the exquisite control of the telescope’s position on the Earth offers research capabilities that satellite and balloon missions cannot attain. I bet it’s really hard to fly a telescope inside an airplane and make it work…how do they do it? 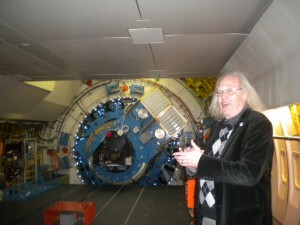 Eric Becklin, Chief Science Advisor of SOFIA, explains the pressure seal behind him. Usually, the walls of a plane protect the passengers from the -40 F temperature and low pressure at high altitude. However, the telescope needs to be exposed to the open air to do observations, and so the back of the plane fills with cold, low-pressure air. Designing a pressure seal between the temperate crew compartment and the telescope was a major challenge for the SOFIA team. How do you keep a 2.5-meter telescope pointing at its target while it flies through atmospheric turbulence? These two components help the German-made telescope point. Unlike most ground-based telescopes that have structural support in multiple locations, the SOFIA telescope sits in a single ball-and-socket joint. Between the ball and the socket is a layer of oil only a few microns thick. This oil is so low-friction that if you (that’s right, you) walked up to the telescope and pushed on it, you could make all 20,000 kg of it accelerate! This smooth repositioning is critical in turbulence. The electronic gyroscopes measure the pointing and keep the telescope staring at the same patch of sky (to within one arcsecond) as the plane rolls and bucks beneath it. You can read more about the technical details of the telescope here. The seating on SOFIA sure beats first class! 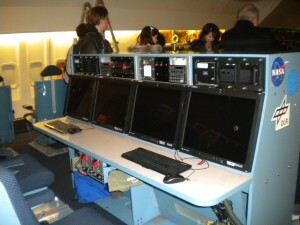 Consoles for different purposes–flight operations, telescope pointing, and more–dot the floor of the cabin. Each instrument that can attach to SOFIA has its own console that can be inserted when SOFIA is flying with that instrument. For more information about the different instruments onboard SOFIA, see this. Since telescopes can’t see through airplanes, SOFIA needed a door. The door was custom cut and cost as much as the telescope. What can we expect to see from SOFIA in the future? SOFIA has completed 38 flights so far. The SOFIA program has a goal of obtaining 1,000 hours of science observations every year when it becomes fully operational. The SOFIA team expect the aircraft to survive for 20 years. Because SOFIA returns to the ground between flights, it is easier to maintain than, say, the Hubble Space Telescope, so 20 years of successful science seems doable. If you are interested in doing research with SOFIA, the call for proposals is here. If you are a teacher, you can apply to the SOFIA Airborne Astronomy Ambassadors program.